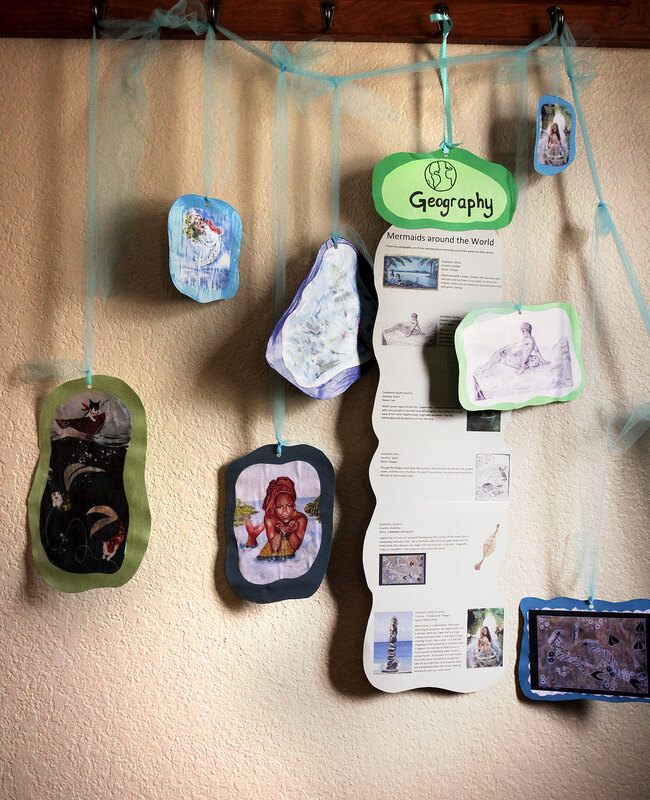 My daughter loves science and mermaids; when she couldn’t decide on a birthday theme, we agreed on an epic sci-fi mashup of mermaids, science, and geography. A pool party seemed inevitable when Ava wrote in her writing journal that her “greatest aspiration” was to become a mermaid. 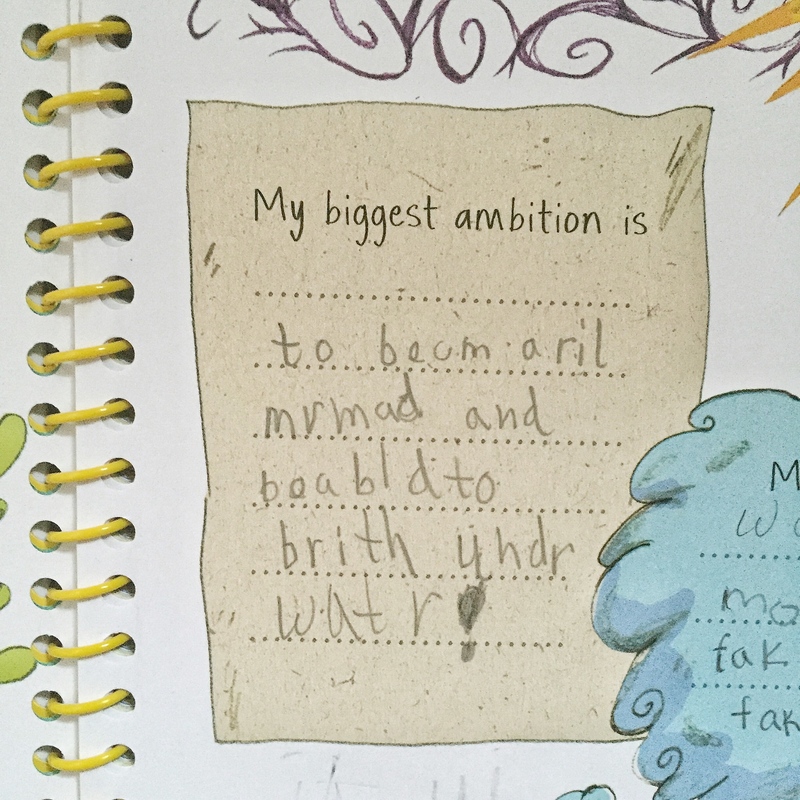 My goals were similar at 7 years old. Many nights I’d dream I was a mermaid, sunning on a rock, only to wake up abruptly whenever I splashed into the ocean, finding that I’d thrown myself off the bed and, instead of landing in a coral palace, I face-planted onto the hardwood floors. I really wanted Ava to think beyond the stock image of “Ariel,” so we spent some time this spring learning about merfolk around the world. We began our study with the Zambian mermaid Chitapo, followed by the Selkie of Scotland (and a few other neighboring countries) – their stories are here and here on the blog, along with recipes to match. 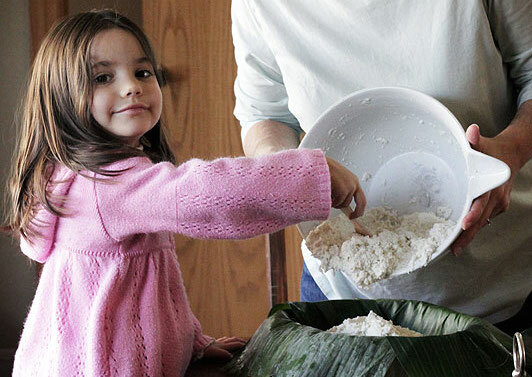 As she learned about these amazing merfolk and ate food inspired by them, her excitement grew. Ava decided her mermaid name would be Emerald. When we got home, Ava and I spent part of our lazy summer days imaging and then creating the party games and decor… a summer camp of our own. 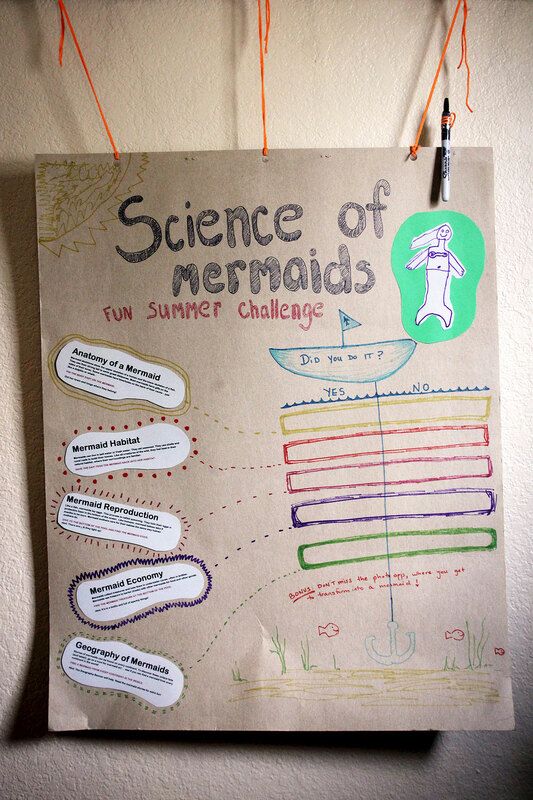 As we were unfortunately unable to make contact with real-life mermaids during our gulf coast family vacation, we did our best to make the mermaid “science” as realistic as possible. The final result was better than I could have ever done on my own (or found at a party store), because my daughter’s imagination operates at 1000%. As an added bonus, we were able to use a lot of materials we already had on hand, which made this party fairly affordable. Mermaids are living creatures which means they have organs, just like humans. They think with their brains, digest food with their stomachs, and love with their hearts. Goal: PUT THE MERMAID’S ORGANS BACK IN PLACE. 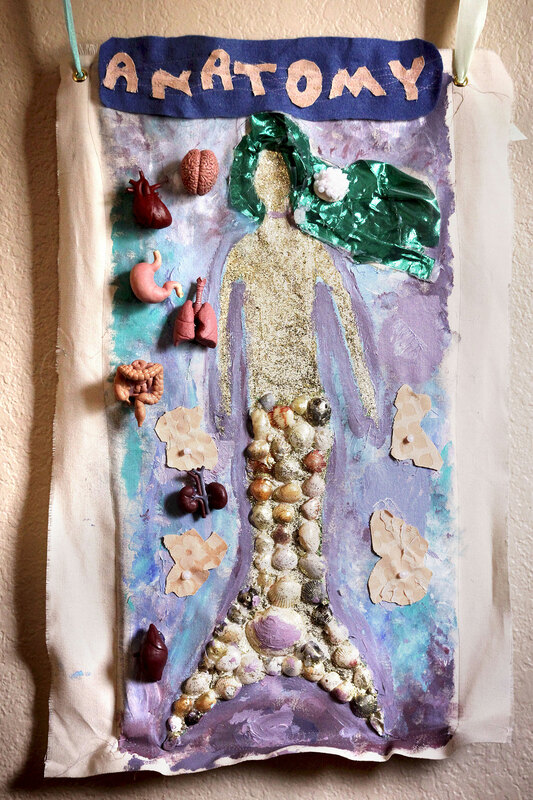 Paint a mermaid on a piece of canvas (this is a great project for older children)! My daughter went all out, adding glitter, shells, and fabric oysters. Just be sure to leave plenty of room on the torso for the magnetic organs. Stitch a piece of sturdy fabric to the back of the canvas to make a large pocket. Slide a magnetic sheet from the hardware or craft store into this pocket. 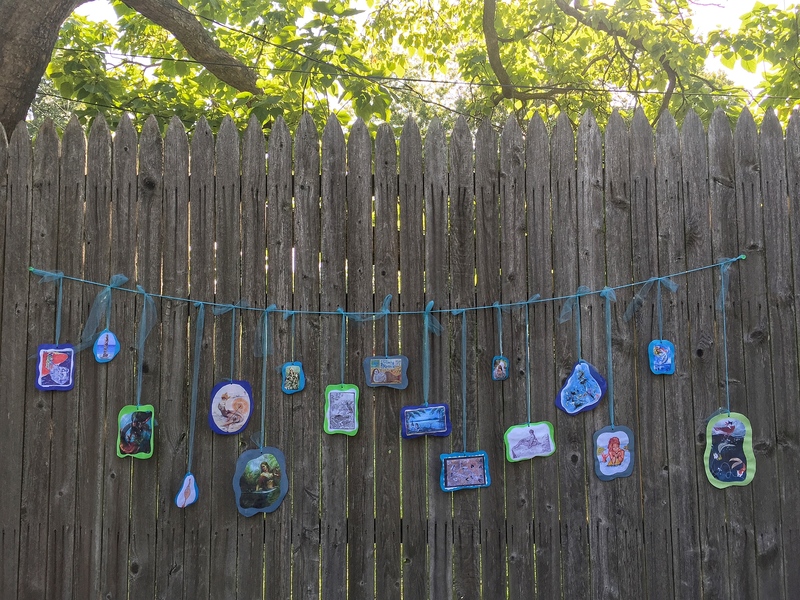 The magnetic sheet should fit snugly in the fabric pocket and should extend past the mermaid on all sides by a few inches (in case children miss the proper area while playing). 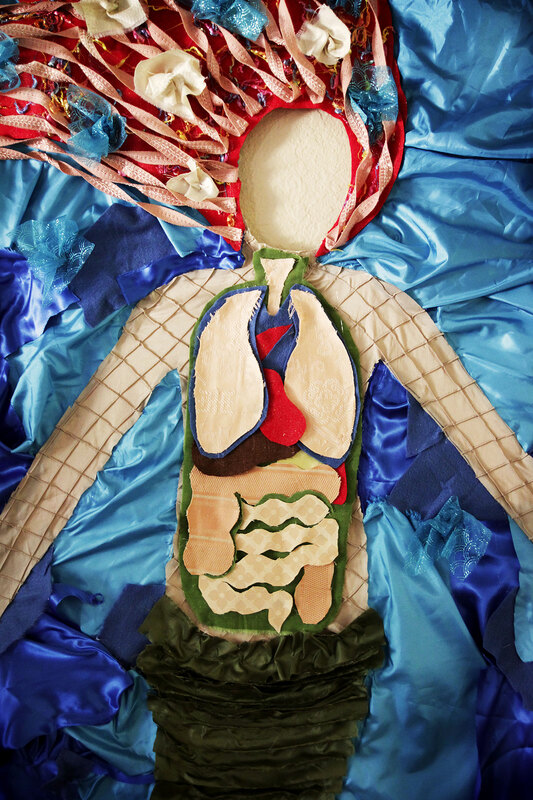 Make magnetic organs – You can find rubber human organs at some craft stores or online. I glued the organs to small, round magnets with super-strong e6000; this worked perfectly for us. Tip: Test to make sure the magnets stick to the magnetic sheet through the canvas. If not, use larger magnets. Play! Older children might want to play blindfolded, while primary and elementary children might want to keep their eyes open and use this as a puzzle challenge. Mermaids can live in salt water or fresh water. They eat seaweed. 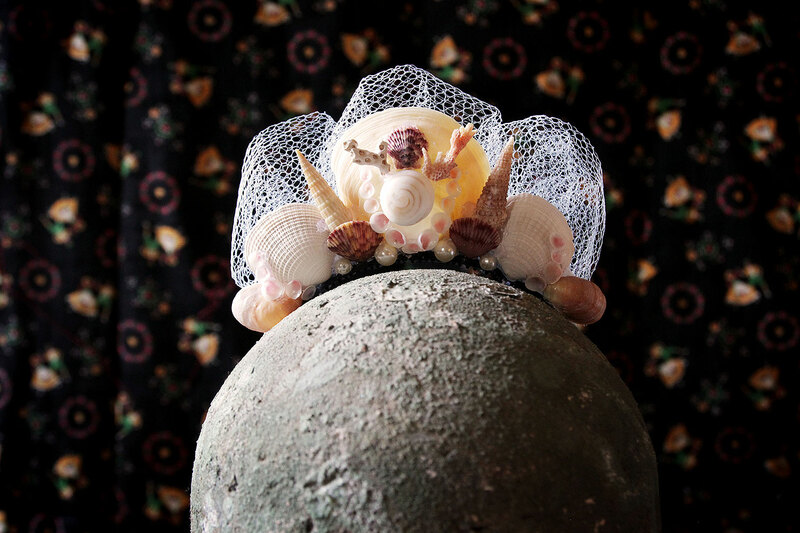 They use shells and coral reefs to build their homes. Like all creatures of the wild, they feel best in their natural habitat, where their surroundings are familiar. Goal: SAVE THE DAY! TOSS MERMAID & FRIENDS BACK INTO THEIR HABITAT. Cut 3-4 holes in a large sheet of plywood or cardboard. Each hole will represent one habitat. Make sure they are a few inches bigger than the soft mermaid toy you’ll be throwing through them. 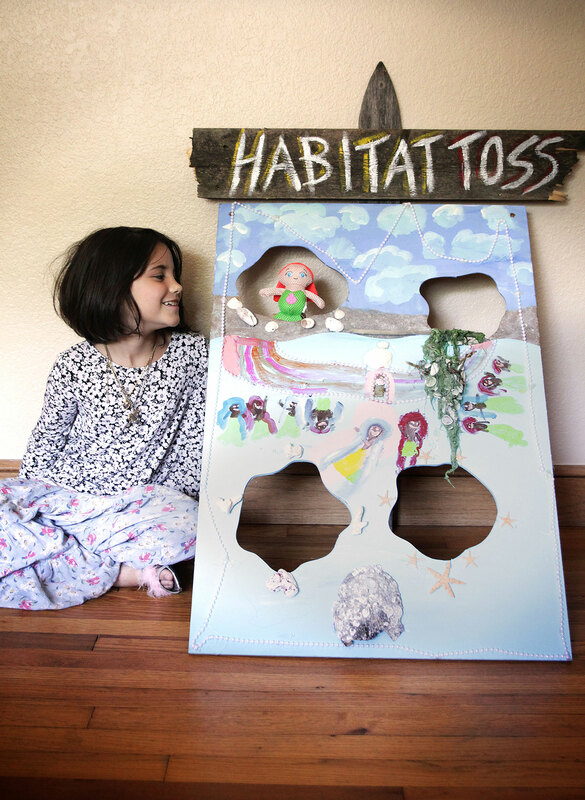 Paint a scene to bring the habitats to life. Again, Ava chose to go all out and glued on shells, sand and seaweed she collected on our family trip in Florida. Play! See if you can toss the mermaid back into each of her habitats. Older children can try this from further back for greater challenge. Mermaids don’t go to the bank, like humans. They collect treasures and hide them in wooden chests, underwater caves, and in bottles. 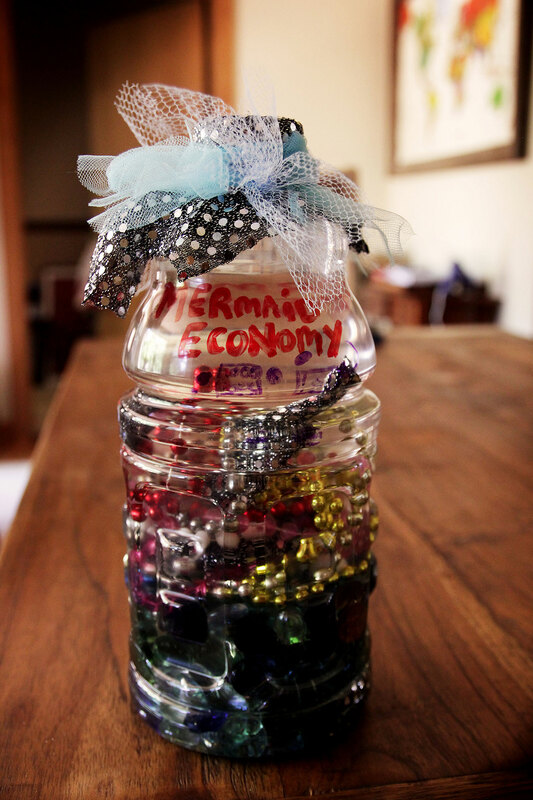 Mermaids use this treasure to barter with other mermaids for food and other goods. Goal: FIND THE MERMAID TREASURE AT THE BOTTOM OF THE POOL. Clean and remove labels from a plastic gallon-size juice bottle. Fill with play treasure (jewelry, coins, and gemstones). Top it off with water to make the bottle’s contents “float” around. Decorate lid and bottle if desired. We attached a fabric cover to the lid to discourage the children from opening the treasure. You could also use duct tape. Play! Drop the treasure at the bottom of the pool for the kids to find. They’ll do this over and over again! Like a fish, mermaids lay eggs. This process is called spawning. They hide their eggs in protective foam in the bottom of the ocean. Like humans, mermaid babies take 9 months to be born. Mermaid mothers care for their babies the same way human mothers do. Goal: DIVE TO THE BOTTOM OF THE POOL AND FIND THE MERMAID EGGS. For the eggs, use water-safe lights, preferably spherical in shape and colorful. These can be found at craft stores and online. Add several to one or more small mesh bags. 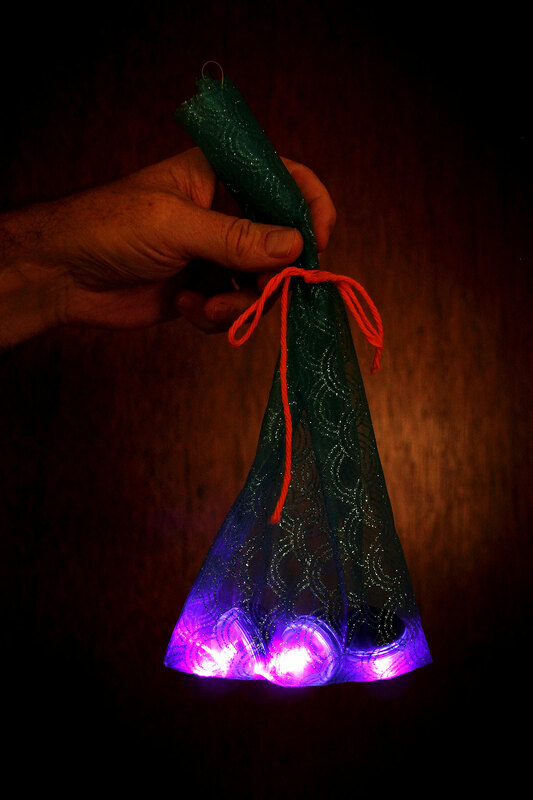 The bag represents the foam, will make the eggs easier to find, and keeps the kids from messing with the light mechanism. Play! 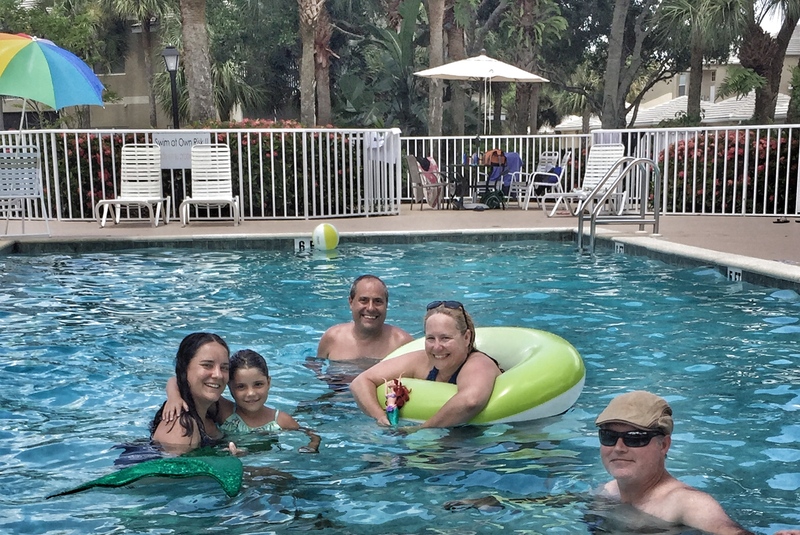 Hide the bags around the pool and let the kids dive for them over and over again. Not all mermaids have red hair. There are stories of mermaids from every continent in the world to captivate your guests. Each has unique characteristics, whether it be seaweed hair, snake tails, blowholes in the back of their necks, or removable seal skins. Goal: MATCH THE MERFOLK TO THEIR STORIES. Download and print my PDF Merfolk around the World. Google images of mermaids. 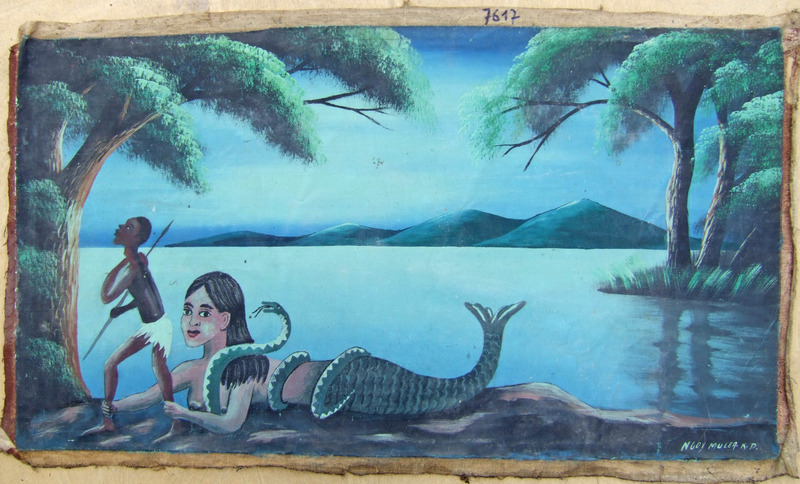 Search by the mermaid names (Chitapo, YawkYawk, Ningyo, Iara, Mama Glow, and Selkie), but also add quirky searches (look for “vintage mermaids” and Chagall mermaid paintings, for example). Cut and glue the mermaid images to colorful card stock, then modge podge to give them a finished look. 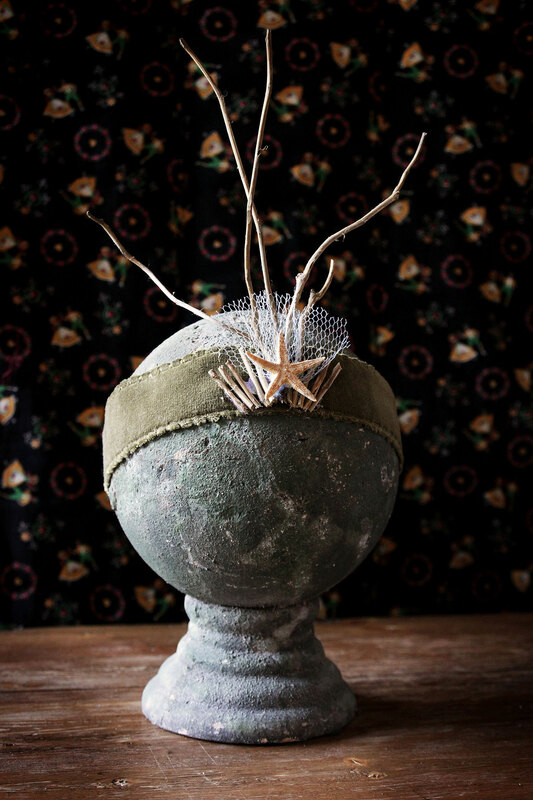 String them up on tulle or yarn to complete the garland. Display the mermaid stories near the mermaid garland. You can add images of the mermaids, if you want. Note: I didn’t get a photo of this at the party – but I do have one below of it all tangled together with the cutouts, waiting to go out the door with the rest of the decor. 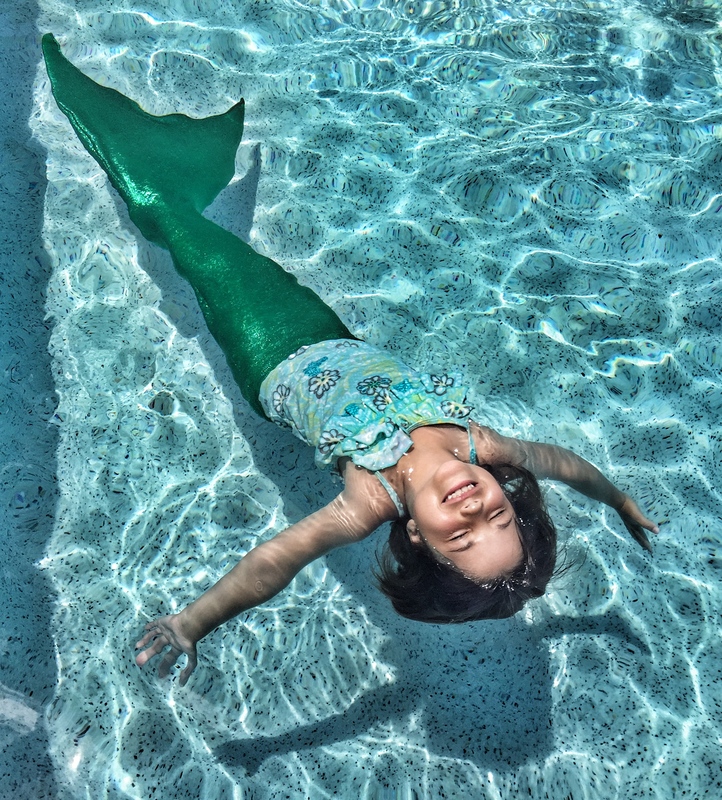 Kids can try to match the merfolk stories to their image, or simply enjoy reading about them. “Becoming” a mermaid was by far the biggest hit at the party. Perhaps this was because her organs were exposed, giving the kids an almost-creepy look-inside. This would make a great Halloween decoration, too! Goal: TAKE A PHOTO AS A MERMAID! Use a large piece of fabric, cardboard or wood. 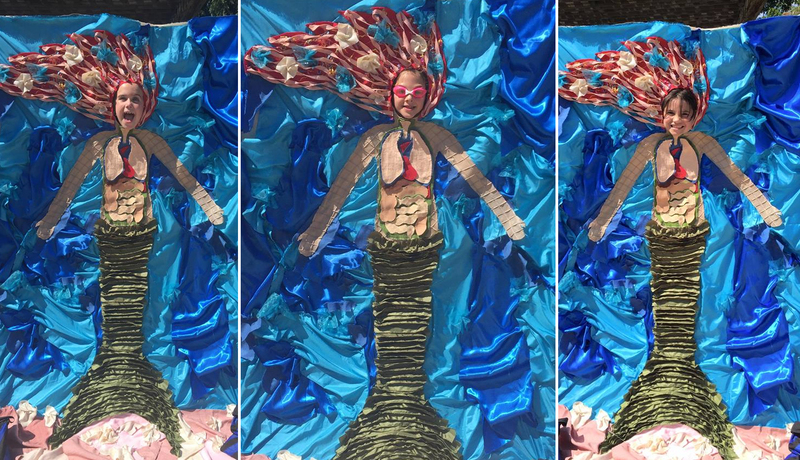 Trace the outline of a mermaid and paint or hotglue fabric to create the art. Be sure to add the inner organs to go with the science theme. I used scrap fabric from a bunch of projects – a great way to clean out my stash. Set up the photo opp so kids can stand behind it and take photos (we hung ours from a rafter and kept a step stool in the back since it was so tall). When the children finished their games, they were awarded with a homemade mermaid crown. 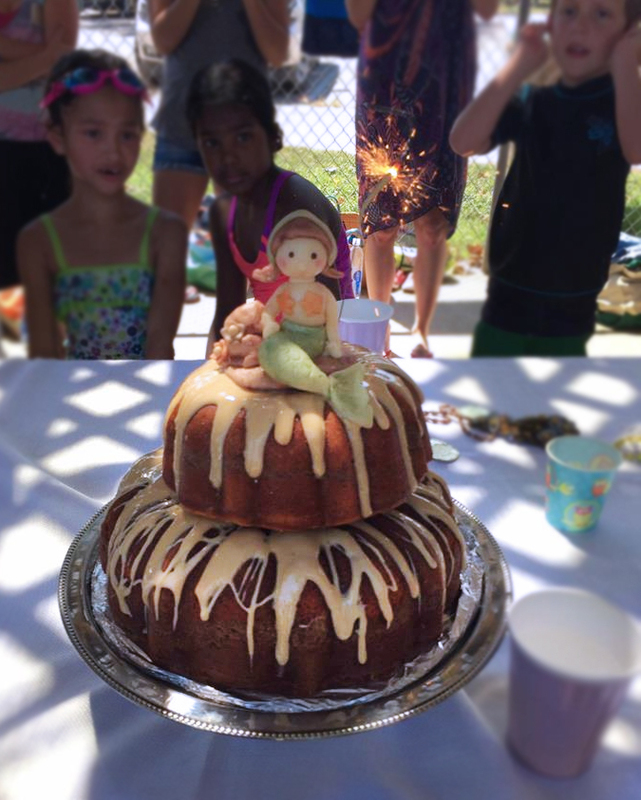 We gave them their crown right before cutting the cake so that the real shells wouldn’t get damaged during water play (and had a better chance of making it home safe). Cut out foam into crescent shapes with a hot foam cutter. We hot glue the crescents to dollar store headbands (3 for $1) to create a sturdy, waterproof backing. Try to find headbands with a chainlink type pattern; this will bond better than a smooth surface. Hot glue shells, pearls, and blue netting to the foam, as desired. Sew fabric headbands. Use elastic to make them fit better. Make sure the fabric you choose doesn’t bleed color in the water. Hot glue on pieces of driftwood. We made “driftwood” by boiling sticks in salted water for an hour or two. (Ava actually thought for a minute that we’d be having sticks for dinner – ha!). Once the sticks were cool to the touch, I peeled off the bark to expose the pale wood. Decorate with starfish from the craft store. 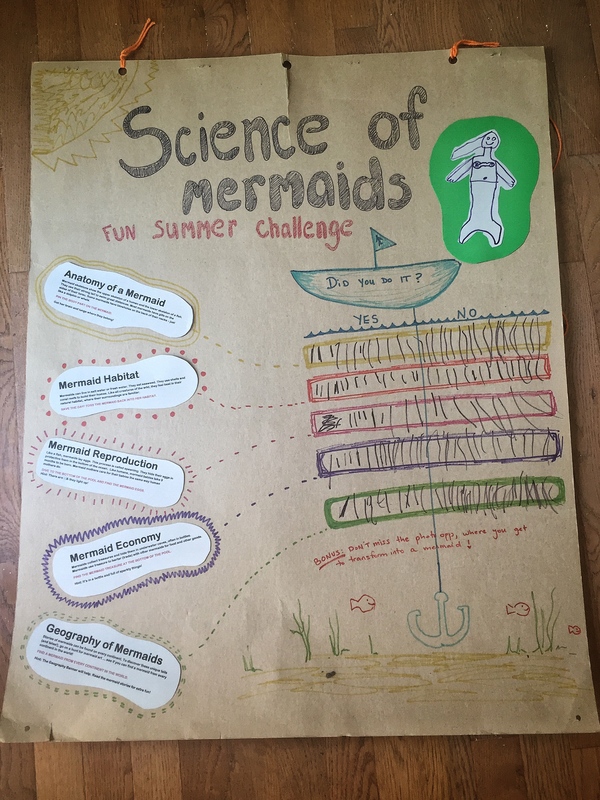 To encourage the kids to try all the games, we created a “Fun Summer Challenge” sign. The kids were invited to add tally marks to show what they’d done (or decided not to do). 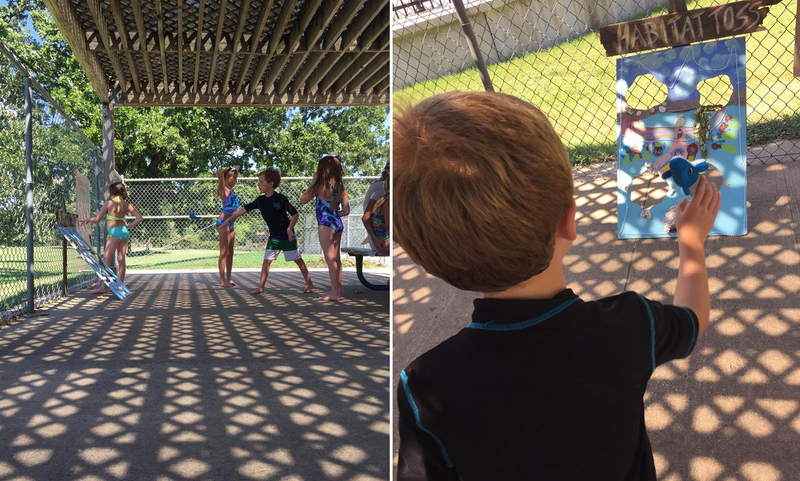 This was also a secret way to help them realize what activities were available to play. 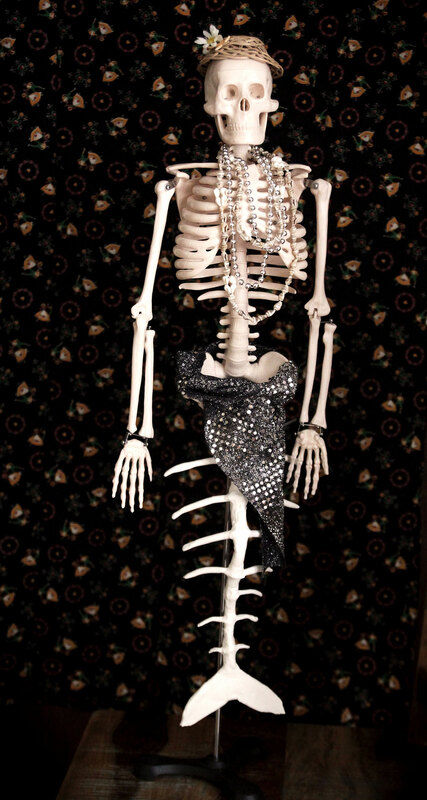 Mermaid skeletons show the upper skeleton of a human and the lower skeleton of a fish. They use their strong tail to swim great distances. Most mermaids have gills on the sides of their torso. Some mermaids have blowholes on the back of their necks – just like a dolphin or whale. Unscrew the legs from a standard skeleton. Use air-dry white clay to form a fish tail for the skeleton. Attach through the skeleton’s pelvis with zipties. Disguise the ziptie with a whimsical skirt. Add a hat and jewelry. Give her a name. Ours is Skelly. I made my first marzipan cake topper and omgosh I had so much fun. Marzipan cake toppers can be made way ahead (weeks or even months ahead if kept clean and covered in an airtight container), making for stress free party planning. 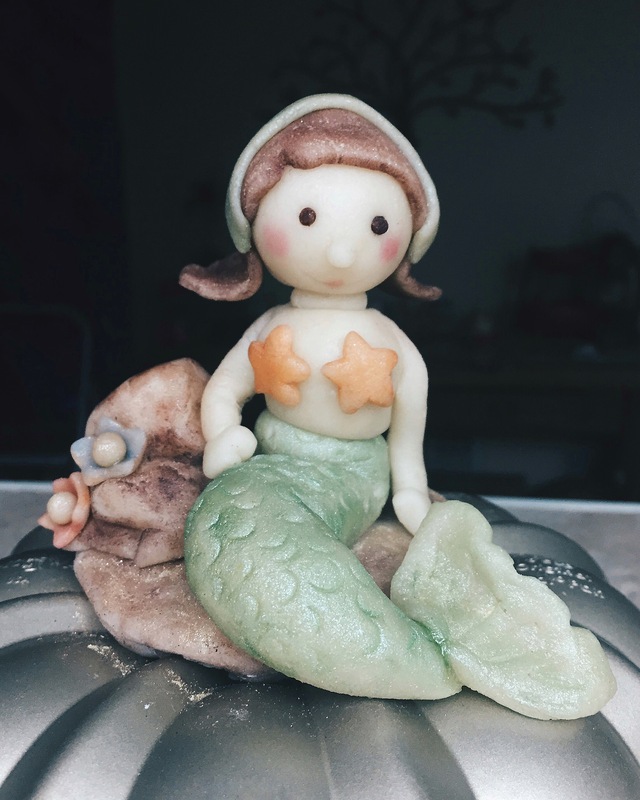 This little gal (meant to be my daughter as a mermaid) was shaped with plain marzipan. She is stacked onto a straw for stability and decorated with color dust. A little edible “glue” was used to keep things like eyeballs and bathing suit in place. I put her on a cardboard base wrapped in aluminum foil. To help her stay put on the bundt cake, I gathered a handful of the foil below the cardboard to make a wide handle. This way, when I put her on top of the bundt cake, the foil handle went into the bundt’s center. I covered any visible aluminum with more marzipan (made to look like sand and rocks). The sweet almond flavor went perfectly well with Ava’s cinnamon bundt cake with maple drizzle. As a bonus, she held up in super hot weather all afternoon. Much preferable to buttercream and more delicious than fondant. 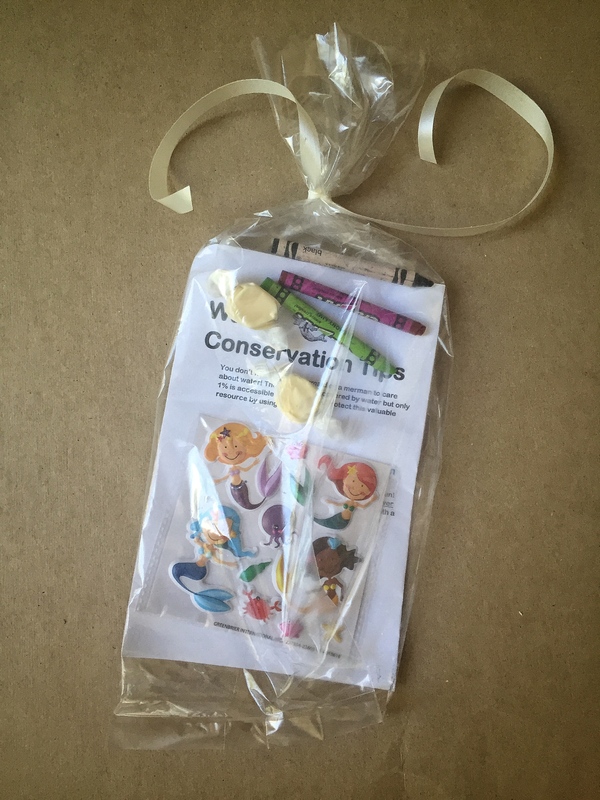 A few salt water taffys, stickers, the homemade mermaid crown, and these Water Conservation Tips(PDF) went home with Ava’s friends, along with a hug and a thank you! Ava wasn’t in many summer camps this year. We had a lot of time to play and create at home, which is part of why we were able to go all out with the handmade items. The experience lasted from spring through half the summer. It was about building projects and memories together over many months, not just a 2-hour party. Ava learned how to use a glue gun and made beautiful art. 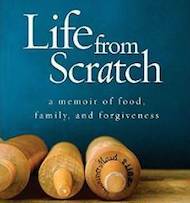 She learned how to use colored dust to decorate marzipan. She did some woodworking with her father. 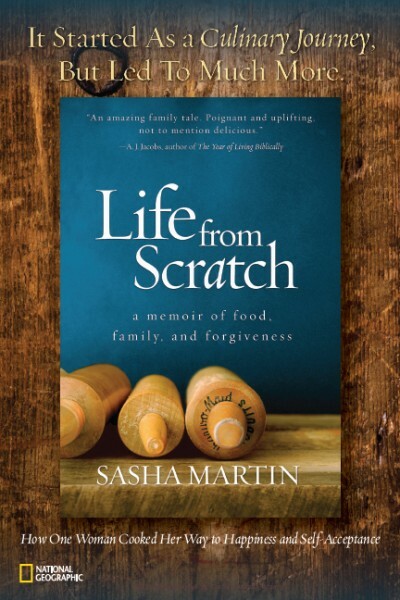 She tried a few international recipes while reading new stories. The party was simply the culmination of her study of science and mermaids – an “art show” of sorts, showcasing everything she’d learned and experienced in the months prior. I am a firm believer that parties are not about going as big as you can… but they should always be about something bigger. 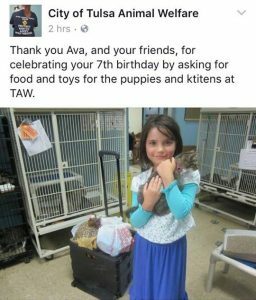 Along those lines, this year Ava donated her birthday to animals in need. Here she is with one of the many animals that will benefit from her and her friends donations to Tulsa’s Animal Welfare center. I’m proud of our girl and grateful to share our experience with you. Sending love to you and yours for all your celebrations! What an amazing human you’re raising – imaginative, creative, generous, adventurous, smart! This fellow science geek – who once taught gave my younger cousin a two-hour long anatomy lesson using the Thanksgiving turkey carcass – couldn’t stop smiling at the mermaid organs game 🙂 As a long time reader, it’s been a joy to watch her grow up via your stories. Happy Birthday, Ava! What a super birthday at every level!! Happy 7th year Ava!! Love to you also. So sweet! Next PostWhat does it mean to eat in peace?